It's always handy to have a folding card table and chairs around -- they're easy to store and move where needed for a variety of purposes. The problem is that they are usually ugly. Either they started out that way, or they have become worn and stained over time with use. 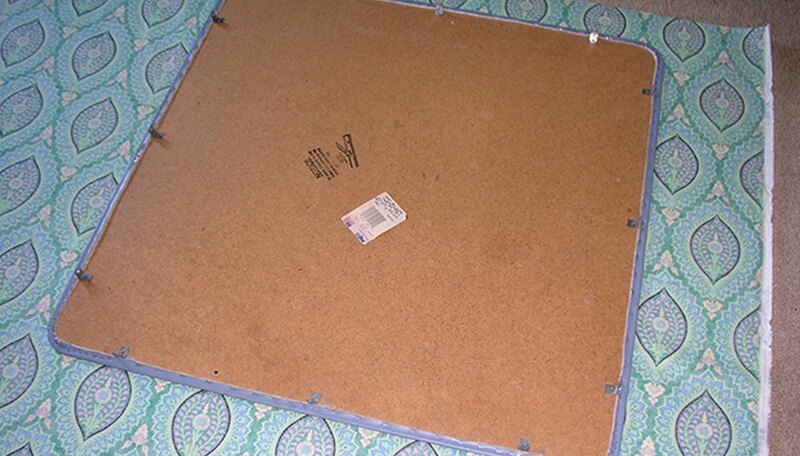 Now you can bring new life to an old favorite or a garage sale find in just a few steps. Before and after - ready for a garden party! Turn the table upside down and remove the screws holding the top in place. (They may be hex head, which requires a socket to remove) Save the screws for reattaching the table top later. Set the table on painter's triangles or other risers to elevate the table from a drop cloth. 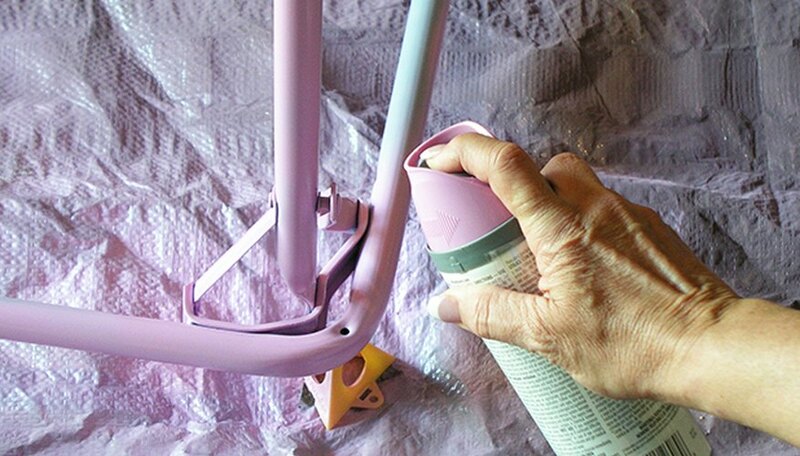 Using even, back and forth strokes, spray the table with a paint color that coordinates with the chosen cloth or vinyl. Hold the spray paint can 8 to 10 inches from the table. Spread the fabric on a flat surface. 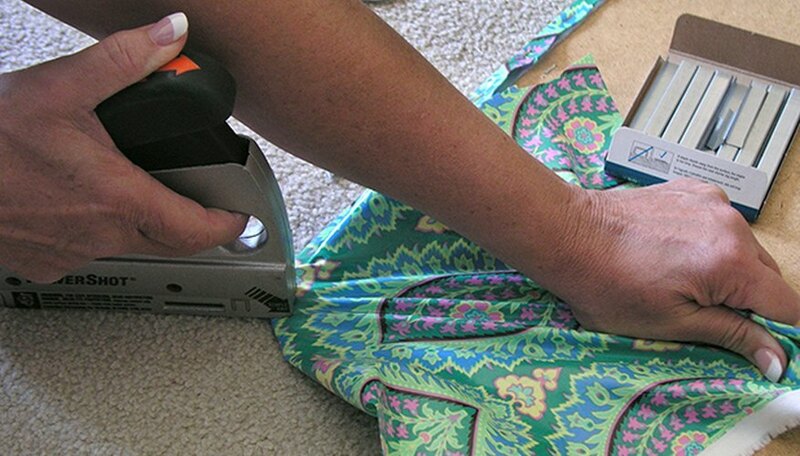 Lay the table top in the center of the fabric, checking carefully for the alignment of the pattern if you are using a print. Starting from the center of one side, tack the fabric in place with 1/4-inch staples. Set about three staples on that side. On the opposite side, pull the fabric tight and set three staples at the center of this side. Turning to the third side, set the center staples and pulling the opposite side tight, set the three center staples here also. Set staples every 1/2 inch all the way around the table, skipping the corners. 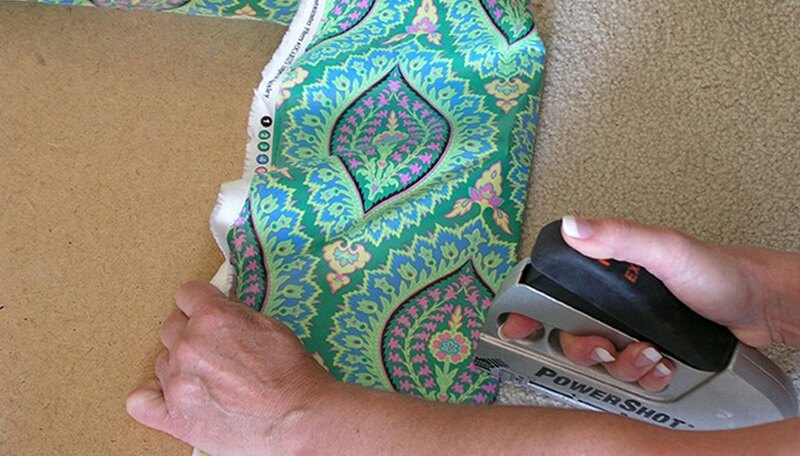 Trim the fabric close to the staples, but leave full pieces at the corners. In the corners, pull the fabric at the center of the curve and set a staple in the center. Work your way around to one side pulling the fabric tight and setting a staple in place until you meet the edge where it has been previously stapled in place. Reverse the working direction from the center of the corner until you reach the opposite edge. Finish each corner using this method. 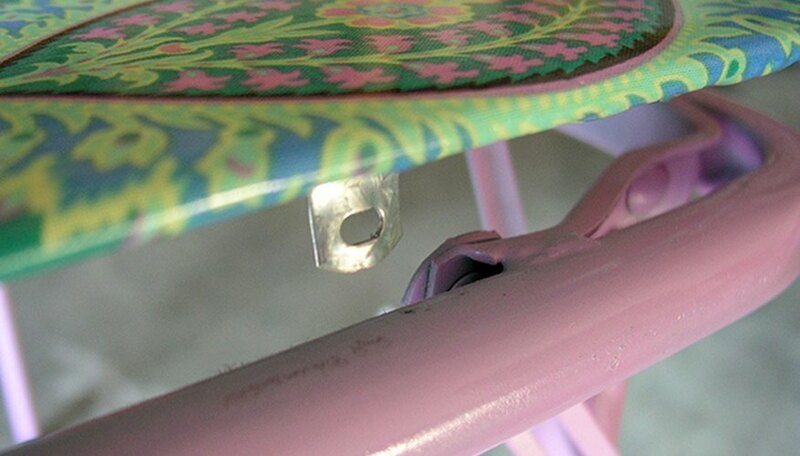 Place the reupholstered table top into the newly painted table frame and replace the screws. 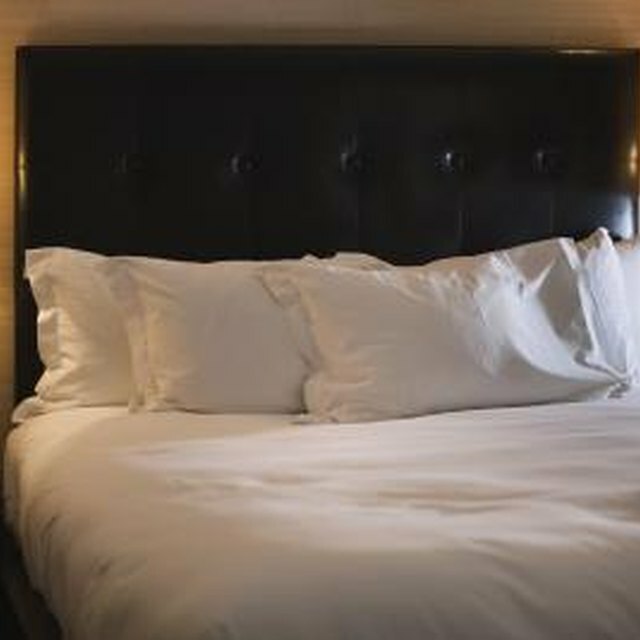 Clean the chairs with a strong household cleaner and wipe down with mineral spirits. Spray paint the chairs in colors coordinating with the fabric and the table. Let them dry for at least 24 hours before using. 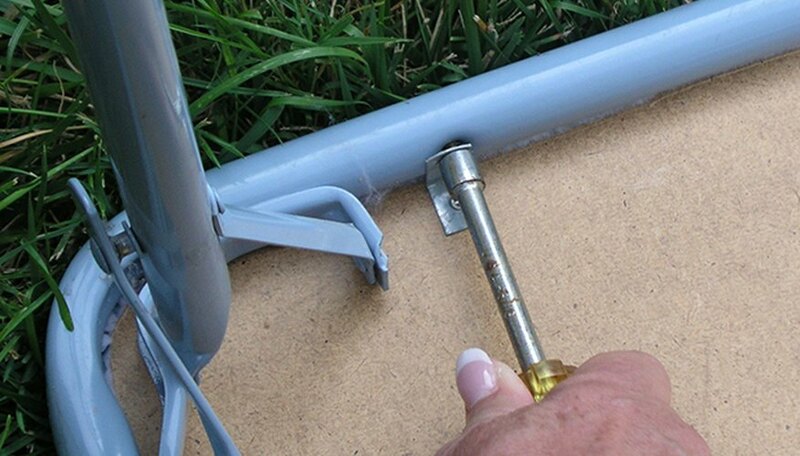 Always spray paint in a well ventilated area and protect surroundings from overspray. 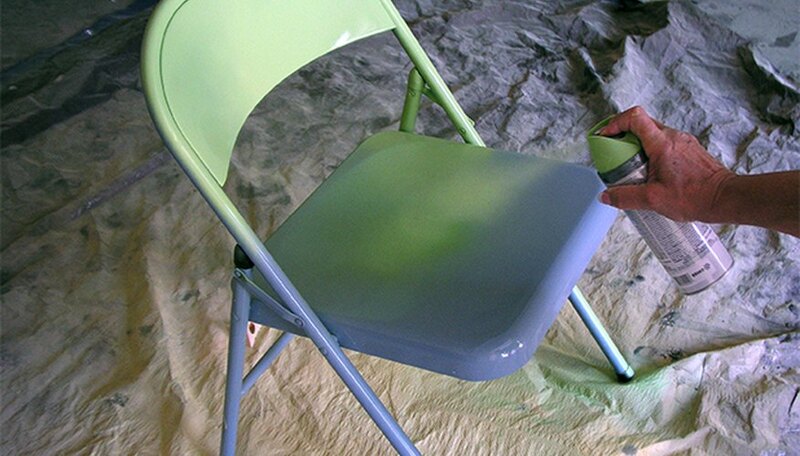 It should take about one can of spray paint per chair.